Americans are increasingly living and working in areas affected by a growing variety of natural disasters. This growing vulnerability, coupled with a rise in the number and severity of weather related disaster events, has caused physical, social, and economic impacts to surge in communities across the U.S. For emergency managers, government officials, and others involved in what are often rapidly changing emergency events, timely access to detailed information about the affected population and workforce is critical for many planning, response, and recovery activities. Such information is important for determining the number and location of people living and working within affected areas. It is also important for identifying impact to various demographic groups and sectors of the economy. Historically, answering such questions has been a challenge due to the lack of a single national source for social and economic data for local areas affected by a natural hazard or disaster event. More challenging still, has been satisfying the need of many emergency managers to receive this information in ‘real time’ as fast moving disaster events change location and intensity. In an effort to improve access to population and workforce data for this important purpose, the U.S. Census Bureau, developed an innovative tool called OnTheMap for Emergency Management. This public web-based application provides an intuitive interface for viewing the location and extent of past, current, and forecasted hazard events on a map, and allows users to easily retrieve detailed reports containing selected population, workforce, and housing characteristics for these affected areas. This capability is offered for hurricanes and tropical storms, floods, wildfires, winter storms, and federal disaster declaration areas. To do this, the application automatically incorporates real-time updates for these ‘hazard’ event areas from authoritative federal sources and displays them in a single easy-to-use map. To provide users flexibility in reporting and visualization of these analyses, each are tabulated and made available at the Census Place, County, Tract, State levels. The tool has been designed to make it easy for users to quickly find and view the information they seek. The interface is organized into two primary sections including (1) a map, where events are added and displayed on a daily basis, and (2) a control panel with tools for locating past events, turning events on and off, and viewing and exporting reports. 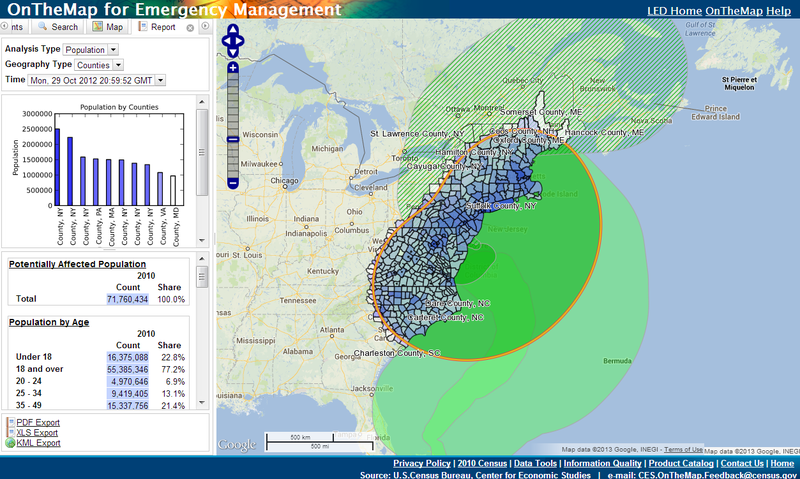 Screenshot of OnTheMap for Emergency Management showing natural hazard activity across the U.S. on October 25, 2012 as Hurricane Sandy moved northward approaching the East coast of the U.S.
Screenshot of OnTheMap for Emergency Management tool on October 29, 2012 showing Hurricane Sandy as the storm made landfall along the East coast. Population and Workforce statistics are displayed in the report on the left for the impact area outlined in orange on the map. By simply clicking on an event in the map, a report tab automatically opens in the control panel presenting the available population and workforce analyses for the affected area. This also adds a thematic overlay to the map for visualizing the geographic location and density of affected residents and workers. The report tab also provides tools for easily exporting the report data to XLS and PDF files and exporting the affected event area shape to KML for use in other mapping applications. 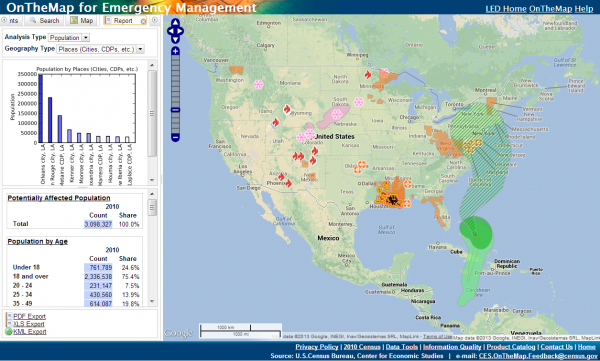 The U.S. Census Bureau’s OnTheMap for Emergency Management application offers a unique service to meet the public need for timely access to detailed statistics describing the local population and workforce affected by natural hazards. To learn more and try the tool for yourself, visit http://onthemap.ces.census.gov/em.html. The accompanying help page provides resources for users including a user guide with walk through examples, reference documentation about data sources, a glossary of terms, among others. Please check out and participate in this new course from National Fire Academy. This curriculum was developed by NAPSG friend and regional leader Capt. Steve Pollackov of FDNY. Great work Steve.